Manchester City thump Chelsea to return to the top of the Premier League. Manchester City jumped back to the top of the premier league with an impressive 6-0 win outclassed a poor Chelsea side at the Etihad Stadium yesterday. With Liverpool’s win over Bournemouth twenty four hours earlier only three points would see Pep Guardiola’s men return to top spot, albeit having played one more game than their Merseyside rivals. England international started the route after receiving Kevin De Bruyne’s quickly taken free kick, before smashing the ball past Kepa Arrizabalaga. 10 minutes later, City’s all time leading goal scorer Sergio Aguero (pictured) made up for missing a golden opportunity minutes early by sending a fabulous 25 yard curling effort past the out stressed hands of Arrizabalaga to make it 2-0. City ensured they had the full points in the twentieth minute when Chelsea midfielder Ross Barkley somehow sent his clearing header straight to the feet of Aguero, how made no mistake in making it 3-0 to the home side. City wasn’t finished their and continued to hammer the nails into Chelsea’s coffin, with a fourth goal minutes later, this time Ilkay Gundogan seeing his angled low drive fly into the back of the net. With the job done City seemed to ease of the gas for the reminder of the half, more than willing to take a 4-0 score line into the break. 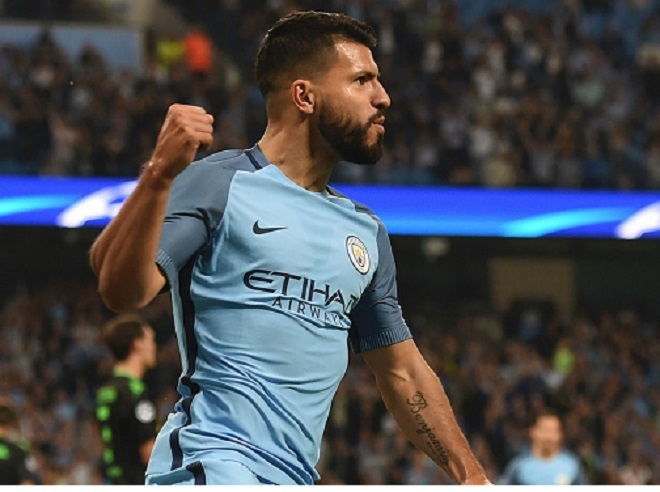 Despite staying in Cruise control at the start of the second period, City were always in charge and added to their tally in the 56th minute, when Aguero again added his name to the history books completing his record equalling 11th premier league hat trick from the penalty spot after Cesar Azpilicueta had brought down Sterling. The hat trick was the Argentinian stars second in successive home games after scoring all his sides goals in their 3-1 win over Arsenal, making it his 15th in City colours and equalling Alan Shearers record of 11 in the Premier League. City finished off the route with ten minutes remaining, Sterling finishing of what he had started 75 minutes earlier with his second of the game benefiting from David Silva’s neat pass to free Oleksandr Zinchenko down the left, before the defender found Sterling to make it 6-0. The result means Chelsea remain in fifth spot after Manchester United’s win over Fulham on Saturday saw them leapfrog the London side on Saturday as the race for a top four spot and Champions league next season starts to really hot up.